The best and worst of Kevin Rudd…again. After my post last week you’d be excused for wondering why I felt the need to give part of my soul to Q&A all over again. This a pretty regular occurrence me (and others I suspect). I very nearly despise the show, but I don’t want to “miss out”. Maybe I’m a masochist. Anyway, last night’s show was probably worth the self-inflicted harm of watching nearly every other week’s version. After a fairly interesting discussion on Libya (I thought it would’ve been enhanced by the presence of an expert or two in the field, but anyway) it basically turned into the Kevin Rudd variety hour. As vainly as Julie Bishop tried (and believe me, it was so, so vain) nothing could shift the spotlight from Rudd’s surprise mea culpa and the minor/major (depending on your interpretation) bombshells he dropped on the Q&A audience, but more correctly, the ALP. It was genuinely compelling viewing and it went to show that with a quality panel (this one wasn’t necessary the highest quality, but it was troll-free, which is a start) and some pointed, original questioning, Q&A could still be the show we hope and expect it to be. Did it escape the banality of Australian political discourse, as I discussed last week? No, it certainly didn’t. Arguably it reinforced it, as the same mistruths and superficialities largely persisted (give or take a few more meaningful comments). More than that, though, it reinvigorated the Rudd/Gillard issue that still captivates an unimaginative, hollow media class. That’s not what I want to talk about this week though. I wanted to just quickly note, as many others did, that last night’s ep simultaneously exposed the very best and the very worst of Rudd. I tweeted at the time that it was genuinely regrettable we don’t have someone as fiercely intelligent as Rudd as our Prime Minister any more. I can take or leave Rudd’s political beliefs. While I find him a very articulate and thoughtful advocate of a set of values which is defensible, I personally agree with him on very few political issues. The worst of Rudd, though, was only highlighted as he became more relaxed and comfortable. I used to think that Rudd’s painful, vacuous attempts at connecting to people and conveying sincerity were confected for the sake of political expediency, now I’m not so sure. Without wanting to be too hard on the man (I don’t know him but he has always come across to me as a fundamentally good person) it became clearer to me last night (and maybe I’m late on this) that it’s just an intrinsic part of his personality. He struggles with himself. He wants so much to connect with the audience, or the public, that he seemingly disassociates himself from any genuine emotive connection or understanding that he does feel. When he said “youse” towards the back end of the show, it was more than just a man acting. All politicians act, and Rudd is better at it than most when he tones it down in my opinion. It was the archetypal act of a man who, in public, is constantly unsure of himself, his personality and his connection to others. Since Gillard and the faceless men with recognisable faces forced him to relinquish the Prime Ministership, we’ve seen far more of Rudd, the tortured soul. Maybe I’m reading too much into these things. 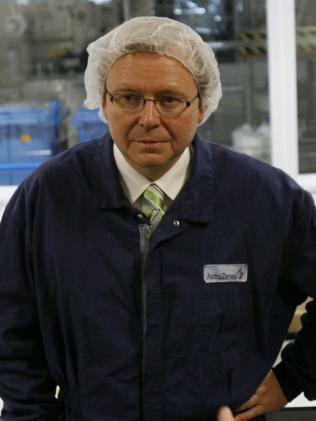 But there are moments the camera pans to Rudd and you can almost see the tension in his mind. A man so convinced of his intellectual capacity (and why shouldn’t he be – he is quite clearly one of the most intelligent people in Australian politics) simultaneously so lacking in self-awareness and perception. Saying this is the “worst” of Rudd isn’t meant to be a judgement of his character as a person. Politically, though, it’s poisonous. And as soon as Rudd has moments of intellectual clarity, he reminds us that, as a politician, and especially a Prime Minister, he is confected to the point of being completely hollow. Again, I want to note, though, that his confection is not the issue per se. It’s the fact that his insecurities so dominate his political (and leadership) style. It’s fine for us to miss Rudd’s intelligence – it’s something sadly lacking in the public leadership of the ALP since his demotion, Faulkner’s withdrawal from the Cabinet and Tanner’s departure from Parliament – but last night’s ep only reminded us of all the reasons he made a disappointing Labor Prime Minister.